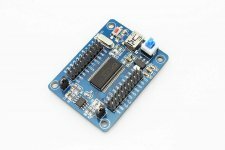 This USB 2.0 Evaluation Board for Cypress CY7C68013A-56 USB Microcontroller provides an ideal tool for learning about the Cypress EZ-USB FX2LP Microcontroller. This development board breakout all the GPIO of the microcontroller, so it will be very convenient for learners to expand their own design. It alao use the actual silicon for the entire development, Cypress's software utilities and example firmware allow the user to generate USB traffic in hours, not weeks! For the very details you can access the EZ-USB® Technical Reference Manual (TRM) at Here. For software collaterals download SuiteUSB.